The more I read about artistic restrictions in the Soviet Union the more horrified I am. 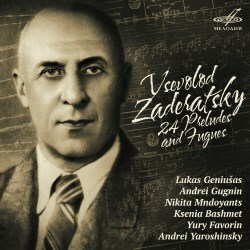 In the case of Vsevolod Zaderatsky it was a catalogue of disasters that ended with his arrest in 1937 (one of many) ‘for propaganda of fascist music’ because he had an orchestra he formed at Yaroslavl’s music college play music by Wagner and Richard Strauss. Today one might be forgiven for using the phrase ‘you couldn’t make it up!’ During this incarceration in a Siberian gulag in Kolyma where, as Wikipedia explains, ‘Average winter temperatures range from −19 °C to −38 °C (even lower in the interior)’, he managed to procure paper - much of it telegraph forms - and to compose this remarkable set of 24 preludes and fugues, reviving Bach’s tradition several years before it was attempted by Hindemith and almost 15 years before Shostakovich produced his set. Released in 1939 he finally ended up in Lvov teaching at its conservatory, but any dreams he may have nurtured about having any of his works performed were soon dashed by the continued ‘struggle against formalism’, although what can be thought as formalist about these pieces I seriously cannot imagine. In any event he never received any recognition, and it was 25 years after his death before any of his works were published. (This cycle was only published in 2012 and premièred in 2014.) Without wishing to repeat everything in the booklet notes, his story is so astonishing and his resilience to State pressure so admirable I feel compelled to share it in this review in the hope that it encourages the reader to seek this set out should my inadequate description of the music fail to do so. Composing in the circumstances he endured, and presumably feeling the need to secrete the finished pieces where they were not discovered for fear of destruction—as had happened with all his compositions following his first arrest in 1926—must have been bad enough, but while Messiaen in his prison camp and those brave composers working during their incarceration in Terezin had instruments of sorts, Zaderatsky had only a memory of what a piano sounded like. It is a measure of his ability and his driven determination that he managed to complete such a mammoth collection. Although he had procured a pencil and the paper by some miracle, he had no eraser, so his copies had to be correct from the word ‘go’ and he only ever had to subject a single prelude to any major revision. Irrespective of which composers may have influenced his writing, including his teachers Taneyev and Ippolitov-Ivanov, his music is unmistakably Russian. It is also confident in the extreme and given the circumstances of their creation these preludes and fugues must have been the glue that kept him focused on staying alive. If ever there was a tangible demonstration of indomitable spirit in music, it is this set of solo piano works. Many are bold and powerful and plenty show delicacy and pathos while humanity shines through them all which makes for an object lesson that creative artists often see the hope of a better future despite the hell they may be living through. The première of the cycle took place in 2014 thanks to the efforts of six pianists from the younger generation - the youngest only 27, the ‘oldest’ at 37 is the daughter of violist Yuri Bashmet - who have taken the challenge of ensuring these pieces are heard after so many years languishing in oblivion. It would be fascinating to know what the likes of Shostakovich or Weinberg thought of these works if they ever saw the manuscripts, but I’m sure they would have marvelled at them. Listening again to Prelude no.11 for example I am struck by such beauty having been created amid such horror. It almost beggars belief. All the six pianists do a fantastic job in bringing these preludes and fugues thrillingly to life, and I urge everyone in the strongest possible terms to get their hands on these superb works and allow themselves to be entranced. I have only one criticism and that is that Melodiya should spend a little money on having someone whose native language is English as a translator of the original notes and suspect the same ought to be the case in respect of the German since the English in the booklet is both stilted and at times simply reads badly.